zest & juice of 1 lemon seriously, I highly recommend just using half a lemon...this much seemed to overpower the cherry flavor!! Preheat the oven to 350 degrees F. Butter an 8"-square pan. For the filling, combine all filling ingredients in a saucepan over med-high heat. Bring to a boil, stirring occasionally, and boil for 1 minute to thicken. For crust, combine flours, brown sugar, almonds, and salt in the bowl of a food processor. Add butter and process until crumbly. Add the egg and almond extract and pulse until mixture just comes together. Press 2/3 of the mixture into the bottom of the pan. Pour in cherry filling. Press clumps of the remaining crumb mixture over the cherry filling. Bake in middle of oven for 30-35 minutes, or until light golden brown and bubbling around the edge. Cool for 1 hour before cutting into bars. Store in an airtight container at room temp for up to 4 days. Although I'm a cherry freak, I was totally ga-ga over the "crust" portion of this dessert cuz I'm also an almond freak!?. It was like a buttery-addicting shortbread-sandy!!! So. Darn. Good. I bet it'd be good using a blueberry/orange combo, too. *Don't forget to enter my giveaway for your chance to win a $75. gift certificate to NOVICA! Yine çok mükemmel, yine çok leziz ve iştah açıcı, ellerinize sağlık. Wow! Just love the colour of the cherries, thank you so much for sending it to the event. Gorgeous pictures! I love cherries and miss the really fresh ones I got when I lived in Washington. These bars look delicious--loving that crust! These cherry bars look luxurious! this sound and look really yummy, wish I can try some..
Wow..love the amount of cherries used. Looks very delicious. These photos are stunning! I'd wait for your cherry bars! Oh yeah! I love cherries too. You know what I love about this recipe? I love that the almond extract is in the dough as opposed to being in the cherry mixture. This is the kind of dessert that I would want to eat alone because that way I could smack my lips and enjoy it w/out anybody looking at me like I was crazy - LOL! the cherry bar looks scrumptious..loving the gorgeous color of cherries..
Cherries are my favorite fruit and you did it up perfectly. This is a must try for sure. Yum! Check out my CSN giveaway and I hope you enter! I remember cherry season well in SW Michigan. I dated a guy whose family had a cherry and apple farm. I've picked a few; the phrase chunking cherries sticks in my mind for some reason. Your dessert looks beautiful. Mmm, please send me some for breakfast. Fruit desserts are my all-time favourite. I always had fruit pie instead of birthday cake. And I love your disclaimer! Holy cow! Those look so good. Those pictures are amazing, I just want to dive right in! I've been seeing cherry's everywhere this week, I so am going to have to pick some up! Thanks! Cherry picking was a novel activity for me when I moved to the US ten years ago. I started my love affair with it on the first bite. It was a refreshing burst of flavor for which I wasn't familiar with, yet loved it at the onset. Im thinking I will have the exact feeling when I bite into these cherry-almond bars of yours. I love the buttery crust already...yum! :) While you guys are teetering, are you saying careful,careful just a little bit higher? LOL I've seen/heard my twin boys pulling stunts like that. I don't know where you find the time woman to come up with such delicious creations!!!! I think I need to move somewhere between you and Kim and I can race from house to house for a bite to eat. I love cherries - bring on summer I say. This looks seriously good - especially like the idea of the "almondy" crust. I could use a piece of this. "(p.s...while I respect your right to be a smarmy a*#hole, I prefer you don't do it at my place...so if ya do, you'll probably be deleted)"
Cherries baked in anything are a weakness for me. I used to HATE cherries, but in the past two years or so, and only during the summer, I find them divine. This looks incredible! Great BSI entry!! I need to get going on that before the week gets away from me! Wow and drooool! 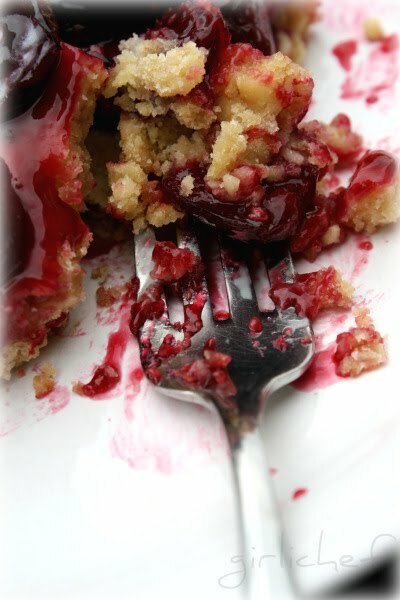 Love love cherries, and this messy goodness recipe of yours. Everything the topping and the cherries. Sadly Cherries are not be found here anymore, seems like our season passed. I'll have to bookmark and pay this one a visit later. cherry bars are one thing, cherry-almond bars? a whole new level of deliciousness. love it! Hi Heather, there was some problem and error occured, that's why you couldn't see the images, please check it again for me and let me know, if you are able to see the images now. Thank you for letting me know earlier about the images. Thank you for your FABULOUS submission to BSI! OMgosh, can I just say DROOL?! This is so my kind of dessert--I love cherry and almond together. Cherries are one of my favorite fruits too, second to mangos, so I anticipate it just as you do, excpet I'm not lucky enough to have access to cherry trees! Good grief woman, do those bars ever look good!! I've been taking cherries to work for my snack and it's a good thing I have a divider around my desk because I probably don't make a real attractive site spitting out those pits into a napkin. :o) Awesome recipe, thanks!! These are positively luscious! I'm gaga over it all! Almonds + cherries = true love. Oh my lord. I am absolutely hands down truly. I'm a cherry lover as well. Why is their season so short?!?!? That looks like a cookie crust! Then when I read further, it is in fact a cookie crust!!! I want to put that crust on some fruit right away! Ur cherries look amazing - great pics! So classic...the cherry and the almond together...and it never gets old. These are gorgeous and I can just imagine how wonderful this dessert must taste. 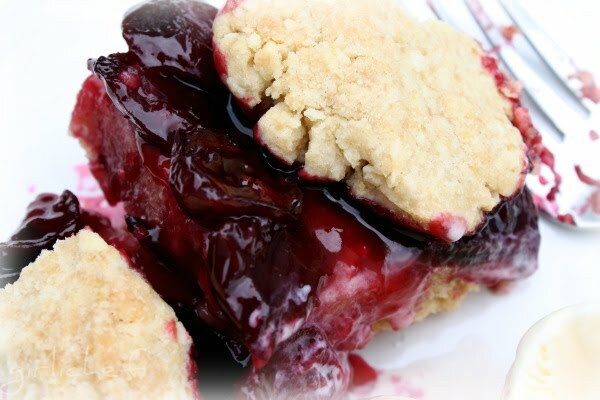 Excellent call on a sweet cherry recipe. This looks absolutely delicious! I love cherries and I usually have a bunch in my freezer year round but not now - I've finally used them all up before I left for my long trip. Must get some more if I'm not too late! Oh My Gawd I LOVE cherries and these bars are divine! Fantastic! Wow! That picture is to die for! Looks so delicious.